Sealife Resort Hotel is a extraordinary 5 star property which is re-constructed in year 2005 *initial construction 1997* in an area of 3702 sq meters with 126 rooms, situated on a piece of earth just looking at blue-green waters of lovely Mediterranean, on the Beverly-Hills of Antalya which is called Konyaalti. 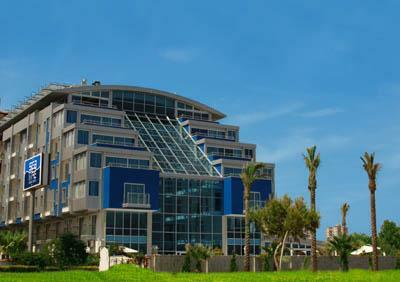 The beach of Sealife Hotel has been awarded with blue-flag, EU sign of excellence. Reception, lobby, 6 restaurants, 8 bars, 2 swimming pool, aqua pool, 2 slides for children, children's pool, indoor pool, spa & wellness centre. 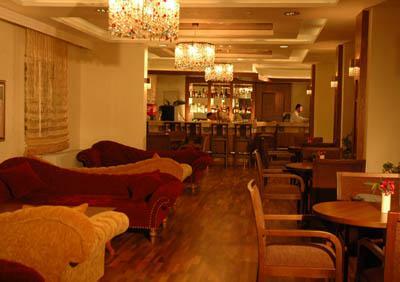 Animations, Turkish bath, sauna, fitness, wireless internet,TV and game room. All imported drinks, ice cream, fresh fruit juices, Vitamin bar, drinks, room service, safety box, all drinks in disco, spa & wellness centre, laundry, water sports at the beach, tenis courts and equipment. Central air-conditioning, minibar, TV, safety box, phone, bathroom with hairdryer. 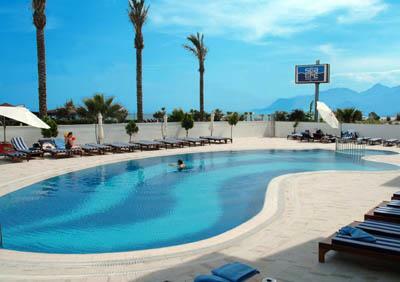 Beautiful pebbly Konyaalti beach is just 50 meters away and easy reachable by passing a road. Sunbeds and umbrellas available free of charge. Late breakfast, snack in the afternoon, coffee break, diner in a la carte restaurants, midnight snack.